How might smoothies help Olympians prepare for Rio? The start of the Olympics is just around the corner. As we look forward to watching two weeks of sport in Rio de Janeiro, thousands of athletes will be making their final preparations for what could be the biggest moment in their career. Although their will to win will inspire their training, we look at ways in which a juicer or smoothie maker might be able to make their much needed and meticulously planned meal times more interesting. Also applies to many sports which require maximal effort levels in training and completion. Swimming nutrition needs to enable the body to recover quickly and replenish energy stores. Olympic swimmers often train three times a day and will often compete twice a day during the Olympics. Important food and nutrients include carbohydrates for energy, protein for muscle repair and fresh fruit for an immune boost. Swimmers can benefit massively from smoothies to give them a complete nutritional boost in between training sessions. Include banana, blueberries, almonds, oats and strawberries for energy alongside milk and protein powder for recovery in your recipes. Also useful for any long distance sports, including road cycling, marathon and walking. When it comes to endurance sports, carbohydrates are absolutely key. Triathletes will often have to train three times a day across all of their disciplines and eating large meals in between sessions is not always suitable or possible. Smoothies can offer an easily digestible source of vital calories and slow release carbs. A number of ingredients that work great in smoothies and are rich with carbohydrates include various nuts and oats. Mix almonds and oats in your smoothie machine until fine. 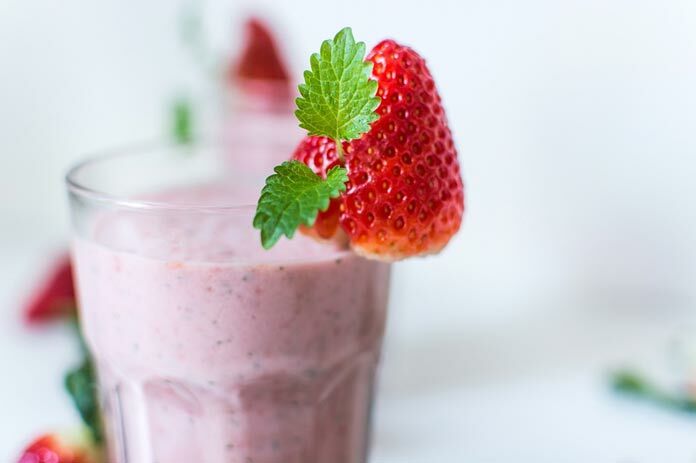 Add in berries and a banana and up to a pint of almond milk and you’ll have a tasty slow release treat packed with vital calories that won’t weigh on your stomach before training or competition. Also useful for any sports taking place over a series of days, including tennis, hockey and handball. Sailing is a sport that requires hard work for a period of hours over a series of days. When you’re dealing with wet conditions and exerting yourself it can put strain on your immune system and it’s often important to give it a boost during preparation and competition. Vitamin C is vitally important to support and strengthen the immune system, whilst the Central Journal of Immunology also found that ginger can also help. Create a fruit juice using oranges and mango in a slow press juicer which will help extract the juice from the pulp and give you a smooth sweet drink. Add a stalk of ginger to give the juice an extra boost and kick. Also applies to other sports relying on physical strength such as boxing, wrestling or martial arts. Although protein is a big part of the diet for many athletes, it tends to be the main thing that weight lifters will consider before and after training. Protein helps repair muscle fibres that have been broken during exercise. Protein is contained in many meats, but many athletes will use food supplements and protein powder to boost their intake. Protein powder can be added to many smoothie recipes. Adding a scoop of protein powder to low fat milk and 2 bananas will give you a protein boost with creamy sweet flavour. Next articleHome Cleaning as a Therapeutic Exercise? This article was written by Will Hitchmough for Juice Producer. Juice Producer are constantly promoting the values of owning juicers and blenders as a convenient way to get vital nutrients into your diet.